Pictured (right) is John J Audubon’s illustration of the Rough Legged Buzzard, today commonly referred to as the Rough Legged Hawk. This hand-colored lithograph is Plate #11 from the Octavo Edition of Birds of America – created from 1840 to 1844. “The Rough-legged Hawk seldom goes farther south along our Atlantic coast than the eastern portions of North Carolina, nor have I ever seen it to the west of the Alleghanies. It is a sluggish bird, and confines itself to the meadows and low grounds bordering the rivers and salt-marshes, along our bays and inlets. In such places you may see it perched on a stake, where it remains for hours at a time, unless some wounded bird comes in sight, when it sails after it, and secures it without manifesting much swiftness of flight. It feeds principally on moles, mice, and other small quadrupeds, and never attacks a duck on the wing, although now and then it pursues a wounded one. When not alarmed, it usually flies low and sedately, and does not exhibit any of the courage and vigour so conspicuous in most other Hawks, suffering thousands of birds to pass without pursuing them. The greatest feat I have seen them perform was scrambling at the edge of the water, to secure a lethargic frog. They alight on trees to roost, but appear so hungry or indolent at all times, that they seldom retire to rest until after dusk. Their large eyes indeed seem to indicate their possession of the faculty of seeing at that late hour. I have frequently put up one, that seemed watching for food at the edge of a ditch, long after sunset. Whenever an opportunity offers, they eat to excess, and, like the Turkey Buzzards and Carrion Crows, disgorge their food, to enable them to fly off. The species is more nocturnal in its habits than any other Hawk found in the United States. The number of meadow mice which this species destroys ought, one might think, to ensure it the protection of every husbandman; but so far is this from being the case, that in America it is shot on all occasions, simply because its presence frightens Mallards and other Ducks, which would alight on the ponds, along the shores of which the wily gunner is concealed; and in England it is caught in traps as well as shot, perhaps for no better reason than because it is a Hawk. But so scarce is it in the latter country, that I never could procure one in the flesh there. Nothing is known respecting their propagation in the United States, and I must pass over this subject. They leave us in the beginning of March, and betake themselves to more northern countries; yet not one did either myself, or my youthful and enterprising party, observe on my late rambles in Labrador. BLACK HAWK, Falco niger, Wils. Amer. Orn., vol. vi. p. 82. Adult. FALCO LAGOPUS, Bonap. Syn., p. 32. Young. FALCO SANCI-JOHANNIS, Bonap. Syn., p. 32. Adult. BUTEO LAGOPUS, ROUGH-LEGGED BUZZARD, Swains. & Rich., F. Bor. Amer., vol. ii. p. 52. ROUGH-LEGGED FALCON, Falco lagopus, Wils. Amer. Orn., vol. iv. p. 59, Young; vol. v. p. 216, Adult and Young. Wings long, third quill longest, fourth almost equal, second shorter than fifth, first very short; first four abruptly cut out towards the end on the inner web; secondaries broad and rounded. Tail rather long, broad, rounded. Bill dull bluish-grey, black at the end. Iris hazel, projecting part of the eyebrow greenish-blue, cere yellow. Toes yellow, claws black. Bases of the black bristles of the lore whitish. 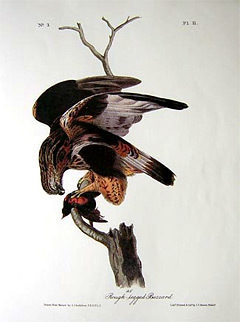 The head and neck are streaked with umber-brown and yellowish-white, the centre and tip of each feather being of the former colour. Back umber-brown, variegated with light reddish-brown and yellowish-white. Quills dark brown towards the end, the outer webs of the first six tinged with grey, the base of all white, that colour extending farther on the secondaries, of most of which, and of some of the primaries, the inner web is irregularly barred with brown. Upper tail-coverts white, irregularly barred with dark brown. Tail while at the base, brown and mottled towards the end, with a broad subterminal band of brownish-black, the tips brownish-white. Middle and hind part of the thorax, with the sides, blackish-brown. Breast yellowish-white, largely spotted and blotched with umber. Feathers of the legs paler yellowish-red, barred with dusky; abdomen yellowish-white, as are the under tail-coverts, which are marked with a small brown spot. Length 22 inches; extent of wings 4 feet 1 inch; bill along the back 1 5/8 along the edge 1 7/12 ; tarsus 2 11/12. The Female agrees in colouring, but is considerably larger. The old bird, which has a very different look as to colour, has been noticed or described under different names. BLACK HAWK, Falco niger, Wils. Amer. Orn., voi. vi. p. 82. pl. liii. fig. 1. FALCO SANCTI-JOHANNIS, Bonap. Synops. of Birds of the United States, p. 32.